Bristol was to become a great nursery centre, but there is surprisingly little evidence for the trade until the latter part of the 18th century. In 1480 William Worcestre mentioned the Great Orchard, and Millerd's plan of 1673 names and marks Hobson's Gardens to the east of the church of St. James in the area now between Horse Fair and Bond Street, but there is nothing to show what kind of gardens were maintained. Some ten miles to the north of Bristol, at the little village of Tytherington in Gloucestershire, a small nursery was started in 1714 by John Berry (died 1727). Owing to the fortunate survival of the detailed pleadings in a tithe suit brought against Berry by his vicar in 1721, and of Berry's will and probate inventory, we are given a clear picture of his standing and activities. He must have kept a haberdasher's and general shop in a house (probably Church Cottage in which he was living in 1684) with four other rooms as well as a kitchen and outhouse: When he made his will, 'being aged and sick', in 1726, he held both freehold and leasehold properties, some in Frampton Cotterell and in Stowell as well as at Tytherington. Stowell is likely to refer to Yew Tree Farm on Stowell Hill in Tytherington. His son-in-law James Pullen, gardener, and his eldest daughter Sarah Pullen were to share 'all my moveable Trees at Stowell', while Sarah was to be executrix and was left 'my Silver Tankard, my Silver Cupp, my Silver Spoones with my Clock and Case, all my Shop Goods, Bookes, Booke Debts, all my Fruite Trees, Greene Trees, Flowring Trees and Trees and Flowers in the Home Garden'. 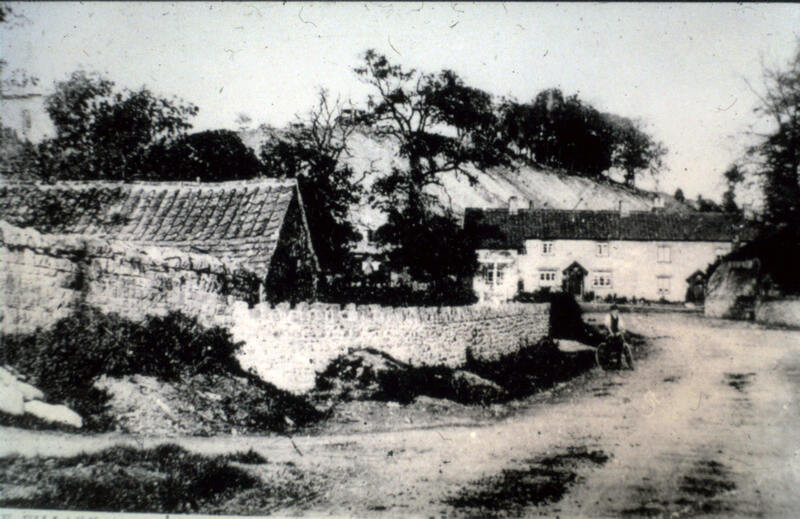 The photo below taken c 1900 shows Church Cottage and the Smithy viewed from West Street. You can just view the Church on the extreme left. From the tithe suit, in which the vicar claimed that Berry had sold quite large numbers of fruit trees and forest and ornamental trees each year from 1714 to 1721, it appears that fairly precise records had been kept. These showed that Berry had on the average yearly numbers of about 150 apples, 100 pears, 200 to 400 cherries, up to 30 plums, 80 walnuts, and a few apricots, filberts, medlars, nectarines arid peaches. He admitted only to very small numbers of bay, cypress and fir, and to average yearly stocks of 100 holly, 50 laurustinus and 350 yew. The preponderance of the yew among ornamental trees is as noticeable in rural Gloucestershire as elsewhere, and shows where profits could be made by the nurseryman on the spot. Berry, though his gardening was a side-line and he was not a wealthy man the valuation of his personal property for probate, doubtless a good deal below its market price, was £67. 16s. 10d. was in his own humble way a pioneer of the provincial trade. 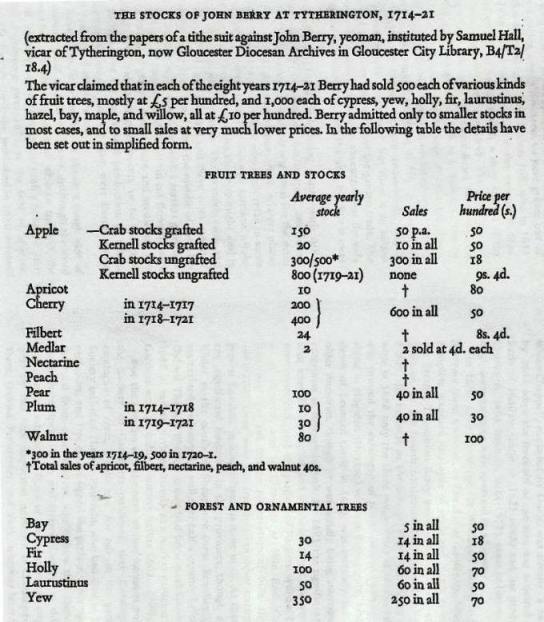 The information on this page appeared in the article 'The Stocks held by Early Nurseries' by John H. Harvey in the 'Agricultural History Review.